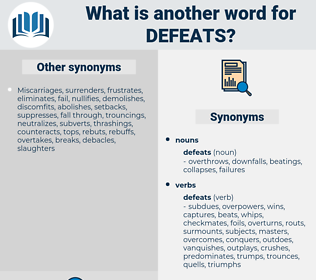 What is another word for defeats? upsets, winning, win, wins, leads, finding, earns, past, Probed, explore, won, ali, hits, passes, Downs, rocks, beat. 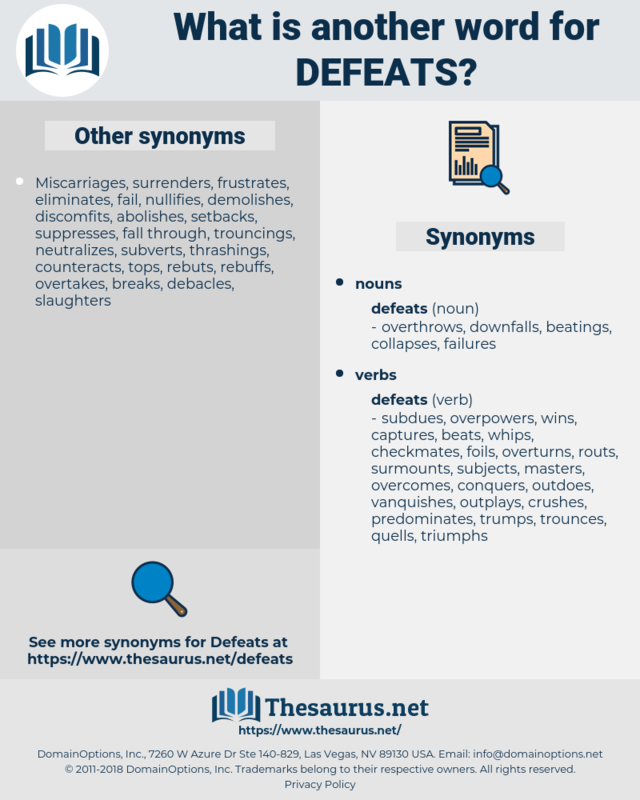 losses, damages, failings, loses, Casualties, losers, burdens, shoulders. transcends, neutralizes, bats, overcomes, Denies, contravenes, flutters, ousts, counteracts, excludes, contradicts, thwarts, overwhelms, oversteps, removes, fails, bests, discourages, Aches, surpasses, Violates, impairs, breaks, crushes, exceeds, strives, flies, shuffles, belies, kills, belongs, stuns, crosses, wins, leads, ali, hits, passes, beat. So I must look even in the dark patches of life, among my disappointments and defeats, and even there I shall find tokens of the Lord's presence, some flowers of His planting. The war dragged on, and despite the English successes which had followed such bitter defeats no one could say when it would end. depot, deep-eyed, diabeta, daft, debate, day bed, DVD, devote, divot, deft, devout, davit, daybed, dubiety, deputy, debit, david, devoid, devoted, deadbeat, depute, devotee, divide, dipodidae, day by day, doped, deadbeat dad, debt, deviate, debut, dipped, doubt, defat, deaf-aid, divided, dead body, duvet, deathbed, depth, defeated, deep-dye.